Hi everybody! Stacie here with Pitch Deck Fire. I am so glad you have joined us for our Pitch Hack of the Week this week. If you haven’t been with us before, we cover tips and tricks on pitching, pitch decks, sales decks, investor pitching and live presentations.  If you are a startup founder looking for funding, or an established company looking for new customers, or maybe you are in an accelerator or incubator program – all of you can find value in our Pitch Hacks. Often times in the startup community you will hear people talk about “your pitch deck”, “send me your pitch deck”, or “you need a pitch deck”; acting as if it’s one pitch deck, but it’s not. You are going to have multiple versions of your pitch deck. Often people don’t think of this but when you are putting together a deck or a presentation, there are a lot of different uses for that deck. Each time you use it in a different way, it is valuable to have a different version of the deck. If you are presenting to potential investors for funding, it’s very likely they will ask to see your pitch deck before you actually come in and present. That pitch deck is what I call a Send Ahead Deck or a Leave Behind Deck, meaning that it is a visual document that you are going to hand to somebody. It is usually in a PDF format and it needs to be able to stand alone without you. They need to be able to read through it and understand the company to really get excited and interested in talking to you. Then perhaps they’ve decided “That sounds really interesting” and they want to hear more. They will invite you to come in. Maybe you’ll have a little conversation with them and then maybe you go through a pitch, you will actually pitch live when you are talking to them. When you do that pitch it will be a totally different pitch because that deck; if it has all the same content and information that you sent to them, a. is a snooze fest and b. if you are reading slides or there is a ton of information on the slide, it will distract the audience from what you are saying. You really want the in-person presentation to be a lot simpler. It should have less information on the slides and be more visually appealing as it is supporting you. It is your supporting aid. It is not supposed to all the information and everything you need for your pitch deck. In that way, you have at least two versions of your deck. Let’s think about the different ways you might use a presentation or a pitch deck. If you are pitching for investment, that will be one type of audience who you are presenting to. If you are pitching to potential customers, it will be a totally different audience and what they care about is going to be different than what somebody who you are hoping to get investment from is going to care about. An investor cares about the 30,000ft view of what your company is, how does it work, where are you going to build it, where are you going to go, etc. Whereas the potential client cares about how it works within their business, what is useful about it, or maybe why it’s better than what they are using today, including some testimonials and case studies. Depending on the audience, those are different versions of the deck. If you are going to be sending a document out, that’s one version and if you are going to be presenting live, that’s going to be another different version. Same thing is true for the different audience groups. If you’re looking for funding or sales, those will all be different versions of your deck. When someone says, “Hand me your pitch deck”. What they are really saying is “Hand me the version that I care about” because there are many different versions of your deck. I hope this little Knowledge Bomb has been valuable for you today. Do not feel like you have one pitch deck or that you need to fit everything into one certain deck. You should have multiple versions of it. I hope that when you are going through the process that you really think through what matters to the audience that you are pitching to and what you are hoping to get out of it; because those are two points that will really drastically affect what you are going to want to put into those pitches. There you have it, that is why you will have more than one pitch deck when you put together a pitch for your company. We have a new Pitch Hack coming out every single week, so I hope you join us again next week. If you have any thoughts or comments on having more than one version that you have put together, I’d love to hear about it in the comments below. If you have any new ideas for upcoming Pitch Hacks there is also a link down in the comments for you to submit your idea. I’d love to answer your Pitch Hack next week. Again, this is Stacie with Pitch Deck Fire. I am so glad you joined us this week and we’ll see you again soon.